Combine scalded milk with next three ingredients. Add butter, sugar, and salt to scalded milk. Stir to combine and let cool to lukewarm (110 degrees). Place ingredients in a stand mixer or large bowl. Place yeast and warm water (110 degrees) in the bowl of a stand mixer or large bowl. With the paddle attachment, mix until dissolved. Add lukewarm milk mixture and 2 eggs, and combine. Add flour and continue to mix until smooth, 3 to 5 minutes. Add raisins and thoroughly combine. The dough will be sticky. Place dough in greased bowl. Transfer dough to a clean, greased bowl. Turn dough over to grease the top and cover bowl with plastic wrap. Place in a warm, draft-free place and let rise until double, about 1 hour. See this quick tip for faster rising. Punch dough down and place on work surface. When the dough has risen, punch it down and turn out onto lightly floured board. The less flour you use, the better the bread will be. If making 1 large loaf, divide the dough into 3 equal pieces. If making 2 loaves, divide dough into 2 equal pieces and divide each of the 2 pieces into 3 equal pieces, for a total of 6 pieces. Roll each piece of dough into a rope about 14 inches long. Use three ropes per bread. Start braiding from the top, as you would for a plait of hair. Let braided bread rise until double. Heat the oven to 350 degrees. Let the bread rise, loosely covered with plastic wrap, until double in volume, 45 minutes to 1 hour. Brush lightly with remaining beaten egg. Bake 30 minutes or until the instant-read thermometer registers 190 degrees when placed in the middle of the loaf. Enjoy this slightly sweet bread. Remove bread from the oven. When completely cool, slice and serve. View the recipe in its entirety. If you have leftovers, they're great in bread pudding. 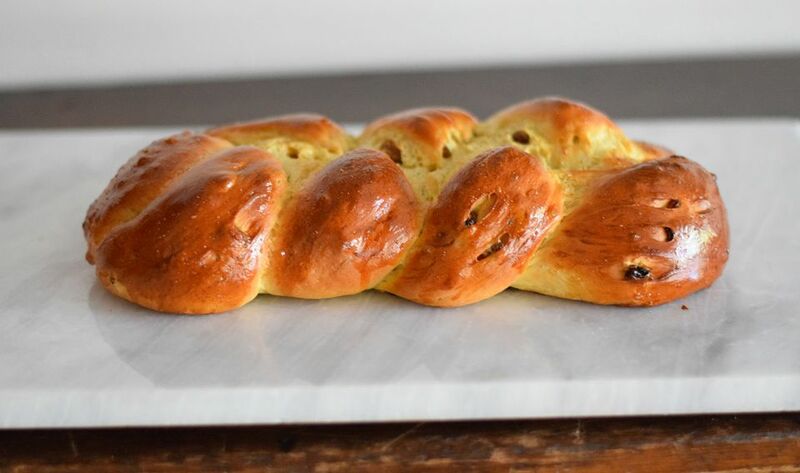 These braiding techniques can be applied to braided egg bread known variously as Czech vanocka, Polish chałka, Jewish challah and Hungarian fonott kalacs.